Next generation music production and performance instrument with a fast, intuitive, and fun way to create. 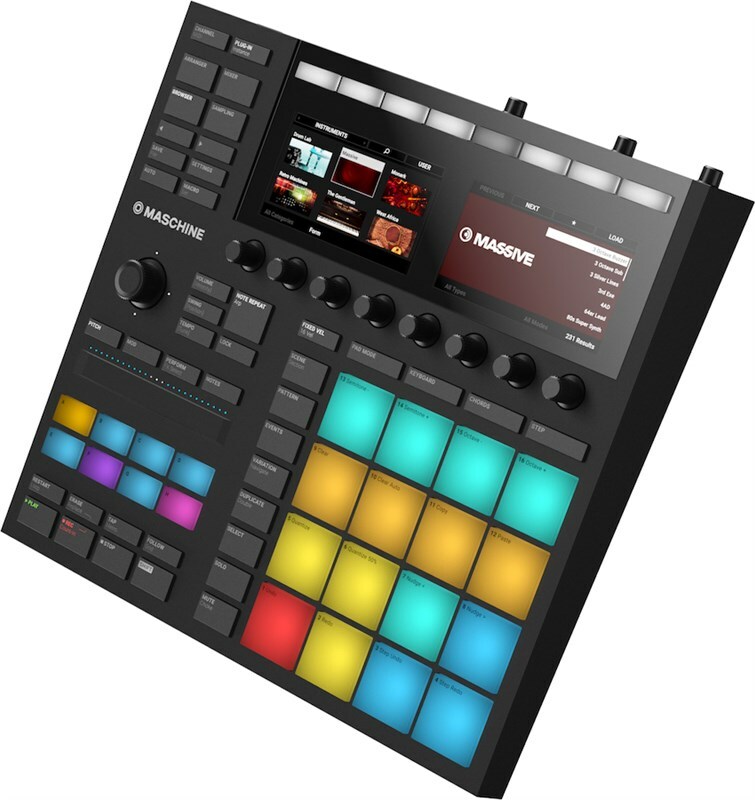 The MASCHINE MK series is essentially considered to be Native Instrument's mainstream and most popular range of MASCHINE controllers. An all-rounder, staple, solid choice for customers wanting a controller that packs a wide range of production applications and has a strong lineage of fantastic build-quality and performance. The MASCHINE MK3 is the latest model in the series and preserves that lineage, this time, sporting a brand new remodelling from the MK1 and 2 incorporating fresh, stand-alone features, as well as applied features taken from other MASCHINE models such as the STUDIO and JAM. Fresh out of the box, we think the new look and build quality is fantastic, applying everything we loved about the MK2 and only improving it further. The new all-metal construction is highly robust yet only weighs an additional 0.4KG more than the MK2. The main body has been elongated by 0.25" and shaved off almost an inch from its height. Produce your music with effortless hands-on control, in Pad mode drum in beats, trigger sounds, play like a piano and more via the MK3's 16 enlarged, ultra-responsive, velocity sensitive pads. Two brand new stunning LED full-colour screens are an impressive addition to the MK3 controller, combined with a four-directional push controller, you can easily browse and navigate through your sounds, samples, FXs, instruments and plug-ins as well as precisely slice up your samples via the ultra-clear waveform display the screens are capable of. Control every element of the MK3 with its 8 touch sensitive knobs that do more than just affect a single parameter. Trigger menus, map plug-ins, FX and more to macros and adjust sound settings with these highly responsive and solid dials. Taken from the MASCHINE JAM, the MK3 features the awesome smart strip, offering you a completely new way to handle the controller to manipulate and experiment with sound. The strip can act as pitch-bend and modulate wheel, adjust parameters, integrate FX such as stutter and scratch, play individual notes and even finger-strum synth chords, samples and more. The MK3 now comes equipped with a built-in, studio-grade audio interface producing high-quality 96kHz 24-bit audio via its rear-facing range of inputs. Attach your dynamic mic, patch in your synth, plug in your guitar and get recording. An updated transport section on the MK3 provides you with intuitive transport controls that integrate smoothly with most DAWs to give you more control of your project at your fingertips. The MASCHINE MK3's locking function allows you to take a snapshot and save your set parameters, manipulate your sounds in real-time, then return to your original settings by hitting the lock button. The included MASCHINE software includes an 8GB sound library developed and populated by professional sound designers and leading music artists. Create music immediately with the MK3 thanks to the inclusion of 8627 readily available samples, 445 playable drum kits, 388 finely tuned multi-sampled instruments, 403 loops, 1200 constructed patterns and 38 projects! Additionally, Register the MASCHINE MK3 to receive a download for KOMPLETE 12 SELECT, a collection of essential instruments and effects catering for a vast array of genres. Gain access to over 25GB of instruments and effects including the pivotal MASSIVE synthesiser and legendary SCARBEE MARK I electric piano among many more. Combined with the immense number of additional compatible instruments, plug-ins and NKS* instruments, the MK3 will keep you busy for a long, long time.